Tokyo Haneda Airport (HND) handles a large volume of Japanâ€™s domestic flights, with Tokyo's Narita International Airport handling overseas flights. Tokyo Haneda Airport flies over 60 million passengers each year and more than 300 take-offs per day. Located 16 kilometres (ten miles) south of central Tokyo, Haneda Tokyo Airport is well served by public bus services, airport limousine buses and train services. Major car rental companies operate from just outside the Haneda Tokyo Airport's main entrance. The airport offers ample parking spaces and facilities. Although Haneda Airport is still known as Tokyo International Airport, the only international flights it offers are the China Airlines flights to Taiwan. Haneda Tokyo Airport was Japan's first commercial airport, serving both domestic and international travellers. However, after the opening of the New Tokyo International (Narita) Airport, the Haneda Tokyo Airport's operations shifted mainly to domestic flights. The Domestic and International terminals at the Haneda Tokyo Airport feature many facilities, which include ATMs, travel agencies, restaurants, souvenir shops and a post office. The airlines that operate from the Haneda Tokyo Airport include Japan Airlines, All Nippon Airways, Japan Transocean Air, Skymark Airlines, Air Do and Skynet Asia Airways. 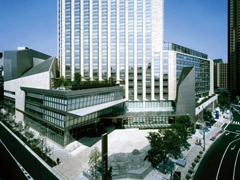 Tokyo Haneda International World Airport Guide provides you with access to a complete selection of Tokyo Airport hotels. Utilize the discounts offered directly from the hotel, with the assurance of secure booking. Extra services include airport car rental, airport car parking and flights to and from Tokyo Haneda Airport.